If you follow me on Instagram, or have even paid attention to posts here where I recommend products - you know that Cosrx is pretty much my go-to brand. They use good ingredients with generally short ingredient lists for their products. There are only a handful of products from their entire line that I cannot use because of alcohol, but the rest of their products make up 90% of my skincare routine. I've been using their products for close to a year now, but only recently started reviewing them, starting with the Overnight Rice Mask then the new BHA Blackhead Cream. Today I'm reviewing a product that I've been using for a while, but still is a newer addition to my routine. 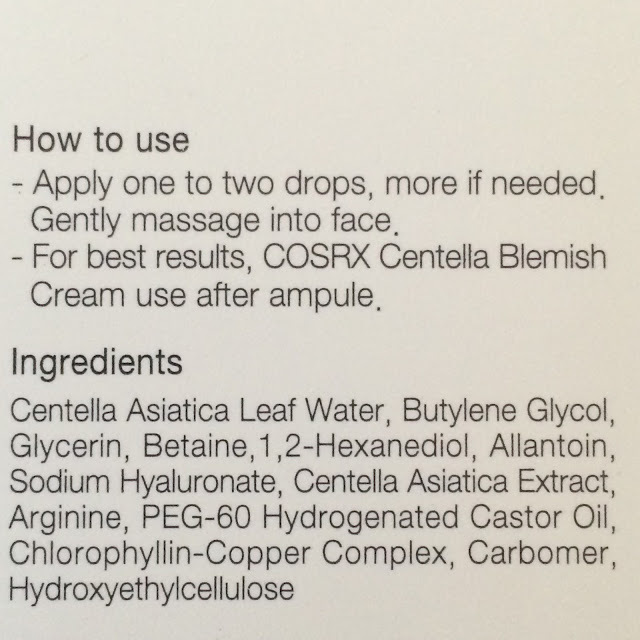 The Cosrx Centella Blemish Ampoule is like a serum, but with a higher concentration of "active" ingredients - in this case, centella. Centella Asiatica comes from a plant and is known to be antibacterial and healing. This ampoule is designed to not only heal acne and and soothe even sensitive irritated skin, but it also claims to control excess sebum and form a protective barrier to prevent irritation as well. Ingredients: Centella Asiatica Leaf Water, Butylene Glycol, Glycerin, Betaine,1,2-Hexanediol, Allantoin, Sodium Hyaluronate, Centella Asiatica Extract, Arginine, PEG-60 Hydrogenated Castor Oil, Chlorophyllin-Copper Complex, Carbomer, Hydroxyethylcellulose. Do not use this product if you are sensitive to butylene glycol, carbomer, or any other ingredients. 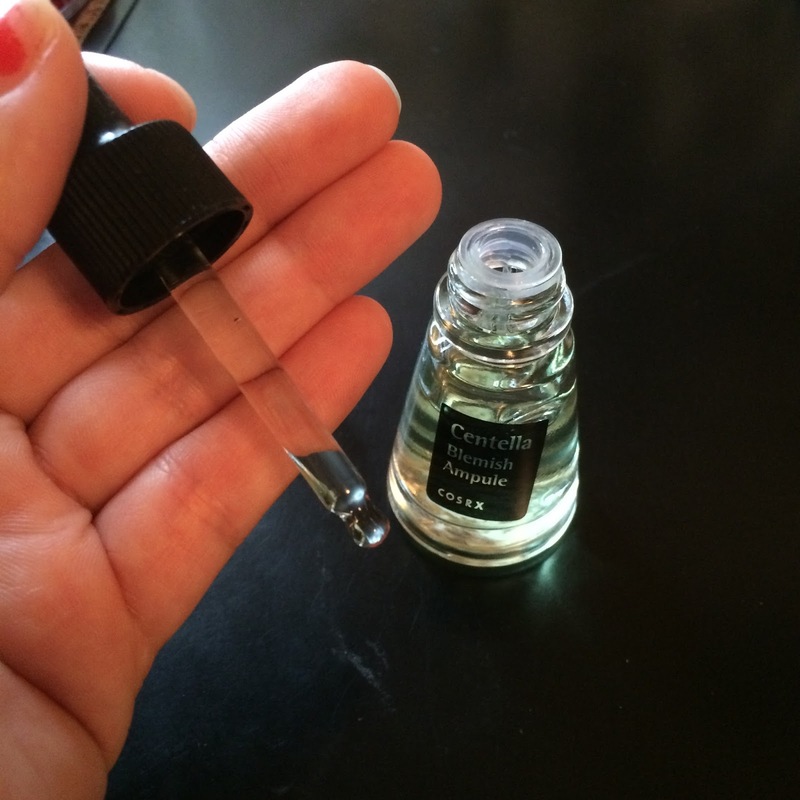 This ampoule comes in a glass bottle with a dropper top - it's easy to use, and very easy to dispense just a few drops from at a time. I really appreciate that the bottle has a plastic insert at the top to prevent spilling and to clean the outside of the dropper of excess product so you're not wasting any of this precious ampoule. The ampoule itself is green in color, due to the Chlorophyllin-Copper Complex. It has an extremely light herbal scent - but it really seems almost scentless to me. The ampoule has the same consistency of a serum; it's heavier than water but still fairly runny. It absorbs into the skin within a few seconds - but it can leave a slightly tacky feeling on the skin. I find this tacky feeling happens more for oily skin types than normal-to-dry types. For this reason I find this ampoule may only work at night for super oily skin types, like me in the summer - right now my skin is dehydrated but oily, and absorbs this beautifully - but when well hydrated it can leave my skin greasy throughout the day. 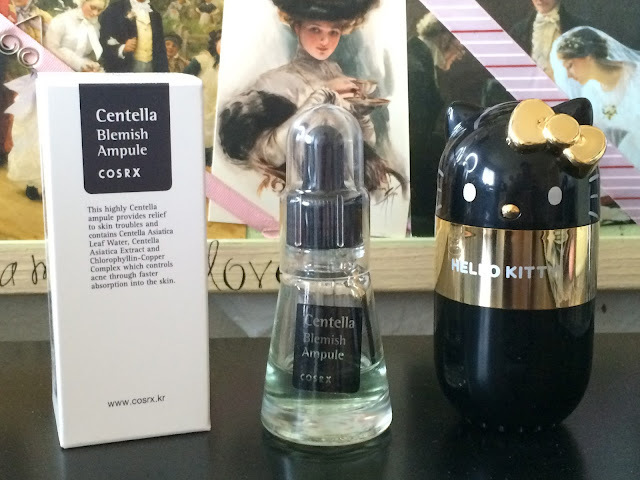 I've been using the Cosrx Centella Blemish Ampoule for six weeks, during breakouts and clear-skin times, and am happy with the results. I struggle with hormonal acne, which can take a long time to clear up because it causes deep cysts under my skin. When I use the ampoule, I notice it reduces the redness and inflammation in my skin, and it does help my acne heal in about half the time (about a week for deep cystic acne). When paired with the Centella Blemish Cream (review coming soon) my acne clears up in a matter of just a few days - it's truly an amazing combo! The Cosrx Centella Blemish Ampoule is a great option for those suffering from mild acne, or looking for additional help in their routine for more severe acne. 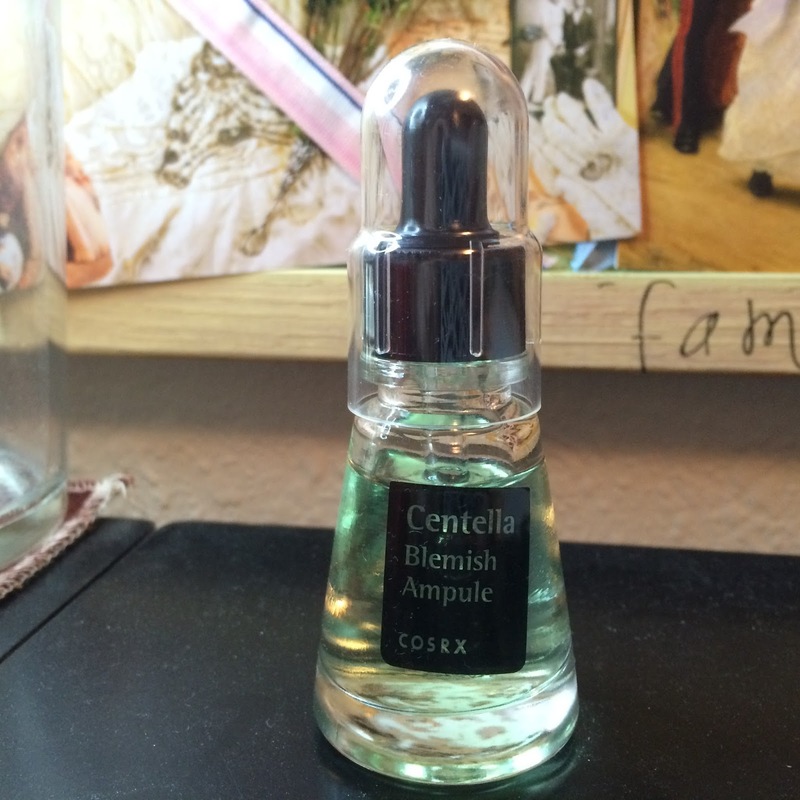 Centella has amazing healing properties, and can also be a good option for rosacea. I purchased this product from Memebox USA*. If you've never purchased from Memebox before, you can save 20% by making an account and purchasing through my referral link*.